Take a rollicking ride through the Wild West with the original cowboy, Pecos Bill. Raised by coyotes to brave the great frontier, Pecos rides his wild mustang Widow Maker and invents the first rough-and-tumble cattle drive. Then he mounts a runaway cyclone like a buckin' bronco to create the Great Salt Lake. 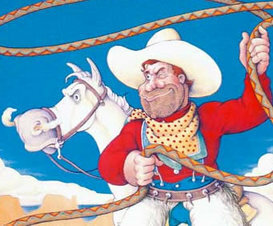 Rich in language, imagery, and sheer nonsensical fun, Pecos Bill is a fast and furious fantasy your family is sure to enjoy.